Teri’s husband barely speaks to her, is completely uninterested in her and her life and she desperately wants children, but her husband won’t sleep with her. She feels unimportant, lonely and abandoned. Sue’s soon-to-be-ex-husband put her down for 20 years, telling her she wasn’t smart enough to go out and get a job or start a business. He told her that she was fat and unattractive. He drank a lot, cheated on her multiple times, although never owned up to it, and still belittles her every chance he gets. But they had 3 children together, a beautiful home, a second vacation home, a long history and her family loved him. She stayed for as long as she did because she genuinely tried to believe that she could put up with the abuse for the benefit of her children and the family. She believed that she should be grateful for the health of her children and the apparent stability of her family. On any given day, there is an abundance to be grateful for: great meals, sunshine, a hot bath, sleeping in, acts of kindness, your favorite warm sweater, a smile from a friend and the miracle of our bodies. We absolutely should be grateful for those small miracles that surround us. But, we shouldn’t use those things as a crutch to keep us stuck in emotionally abusive relationships. 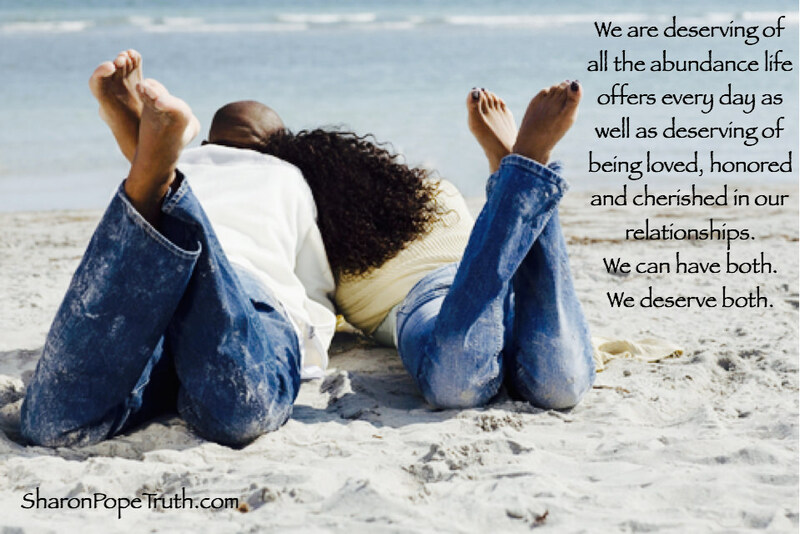 We are, in fact, deserving of all the abundance life offers every day as well as deserving of being loved, honored and cherished in our relationships. That’s not being selfish or asking too much. The awareness about our relationships so that we have the opportunity to create a different experience for ourselves. The strength to get through the difficult days. The support we have from others in our lives. The love that exists at the core of who we are.